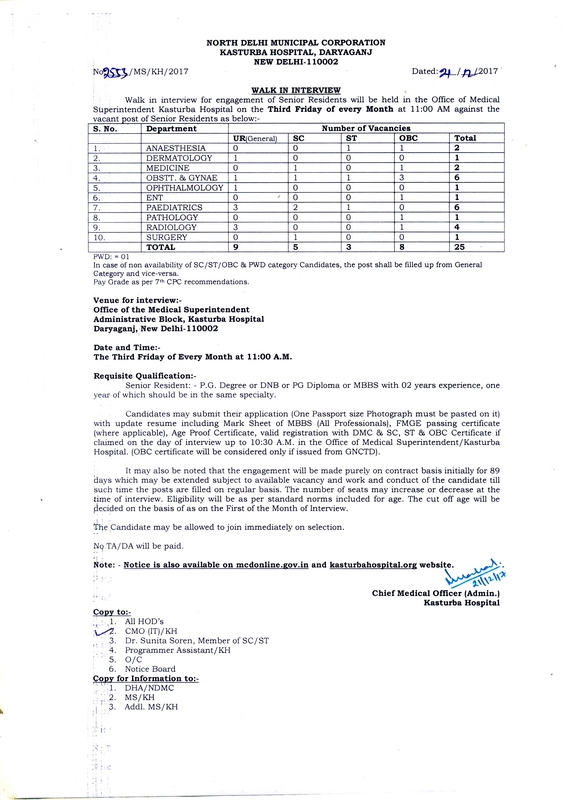 North Delhi Municipal Corporation is going to recruit fresher candidates in India for Senior Resident Posts. So, those candidates who are willing to work with this organization they May apply for this post. Last Date of Apply 10-May-2017. Total numbers of vacancies are 49 Posts. Only those candidates are eligible who have passed Post graduate qualification or two years experience in same branch, including MBBS (all professionals) with FMGE passing certificate. Indian citizen having age in between 18 to 40 years can apply for this Centre for North Delhi Municipal Corporation Recruitment 2017. Those who are interested in these North Delhi Municipal Corporation jobs in India and meet with the whole eligibility criteria related to these North Delhi Municipal Corporation job below in the same post. Read the whole article carefully before applying. Educational Criteria: Only those candidates are eligible who have passed Post graduate qualification or two years experience in same branch, including MBBS (all professionals) with FMGE passing certificate. What is the Process for Selection this Municipal job?